"As a young girl I often spent time making things, drawing and assembling projects without instructions. I come from a line of craftspeople, artists and photographers and have always been encouraged to create. My love of jewelry began with a spool of aluminum wire in High School that led to my first line called 'Lobes.' I went on to college to study Fine Arts in Chicago. 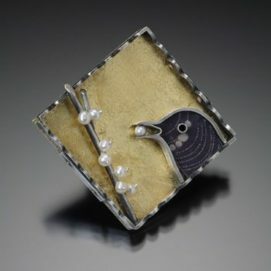 Later, I learned metalsmithing at Pratt Fine Arts Center in Seattle. 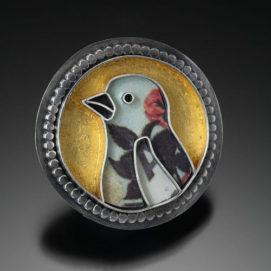 For the past 7+ years I focused on one of a kind Fine Art Jewelry, such as hand fabricated silver bird cameos set with images from my collection transferred to polymer clay. 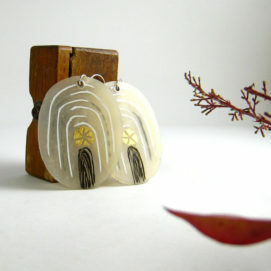 I find inspiration from my love of organic forms, color and image. I visit a community garden in my neighborhood often for inspiration and taking photographs. This spring I embarked on a new line of jewelry designed using organic forms set with photographs that I have taken during my travels or from my image collection. I love seeing the story that takes shape when the two are combined. I build the originals by hand and then have them cast locally with a company that uses mostly recycled sterling silver. I fabricate all of my clasps and ear wires by hand. I also transfer the photographs myself to polymer clay to give the images depth and versatility. They are then coated in a layer of polymer for durability."